Etihad Airways originally announced that it would start flying the first Airbus A380 between New York and Abu Dhabi on December 1. But that date has been moved up to November 23, which is just in time for Thanksgiving weekend and the 2015 Abu Dhabi Grand Prix. The daily flights featuring the A380 will leave New York at 2:30 p.m. and arrive in Abu Dhabi at 12:15 p.m the next day. The return flight flies out at 3:20 a.m., landing in New York at 9:10 a.m.
You might be wondering why everyone is excited about the Airbus A380, and the reason is pretty simple: It offers a luxurious ride in first, business and even economy. Its design includes a lounge called the Lobby, as well as the Residence, which is the only three-room suite available on commercial aircraft. 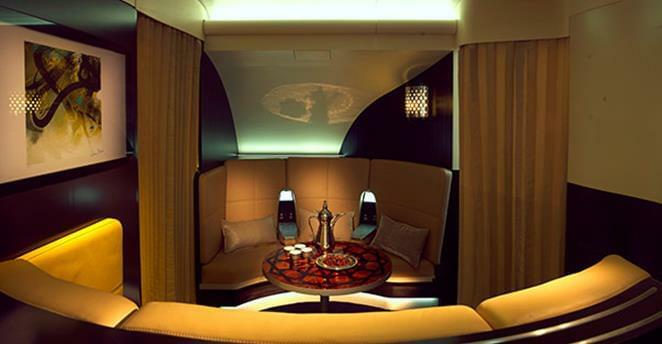 The Residence by Etihad costs about $30,000 roundtrip, and it’s big enough for two travelers. The package includes chauffeured pickup and drop-off at the airport, a private lounge before boarding and private boarding. In many ways it mirrors the experience of flying on a private plane, but at a lower price. The suite itself includes a living room, a double bedroom and a shower room. Passengers who book this suite also get access to a team of concierges, who can help organize travel plans while in the air. They can do everything from making dinner reservations and booking shows, to setting up special events and researching the passenger’s final destination. There is also a Savoy-trained butler on board to make sure that Residence passengers have whatever they want or need while in the air. Last but not least, the Residence comes with a personal chef, who can whip up gourmet meals and snacks upon request. The first class cabin is very luxurious, with nine apartments that give travelers a lot of private space. It’s also super comfortable, and includes a reclining lounge chair, complete with an ottoman, that can transform into a separate 80.5-inch bed that lies fully flat. There are 70 Business Studios on the A380, all located on the upper deck. Each studio offers 20 percent more personal space than traditional business class seats. Each seat includes direct aisle access, and a bed that goes fully flat, measuring 80.5 inches long. Located between the first and business class cabins is the Lobby, a luxury lounge with a fully staffed bar. You can relax on leather sofas, grab a drink and enjoy hot snacks. On the main deck there are 415 economy class Smart Seats, which give travelers in this cabin a more comfortable ride as well. These seats are ergonomically designed, offering adjustable lumbar support and a fixed-wing headrest. Like the Dreamliner, the A380 includes dynamic mood lighting, which is designed to help passengers relax, sleep and then wake up revitalized. Economy travelers also get access to a personal entertainment hub, which includes 750 hours of on-demand entertainment, a private 11-inch touch-screen TV and a noise-reducing headset. Mobile and Internet access is also available on the flight.